An interior view looking toward the altar at Christ Church Episcopal downtown, which opened in 1863. 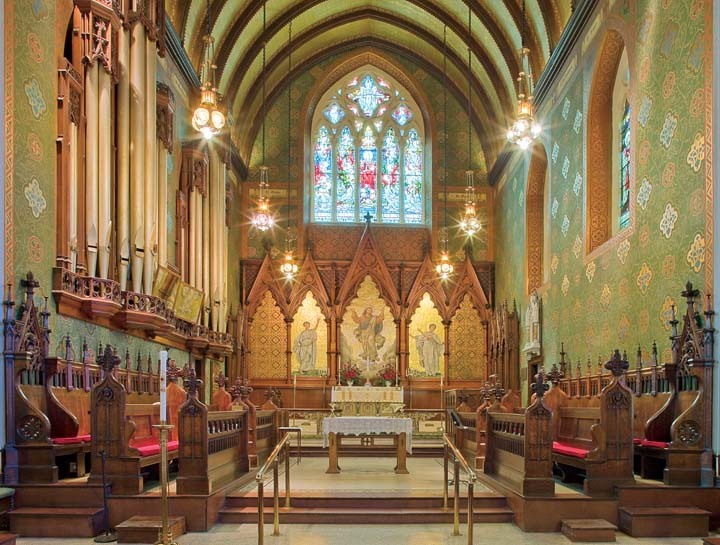 Throughout its history, Detroit has been blessed with an array of awe-inspiring churches and synagogues. In fact, there were so many houses of worship on Woodward Avenue, or just off that thoroughfare, that the area north of downtown was once called Piety Hill. As the city expanded, Woodward Avenue north of Grand Boulevard to Highland Park assumed that same name as newly built synagogues and churches lent a majestic note to the city’s architecture. When the city declined and shrank, many places of worship closed or relocated to the suburbs. But even so, there are many open churches today that merit praise as architectural wonders. That’s precisely what a new and important book, Detroit’s Historic Places of Worship (Wayne State University Press, $39.95) accomplishes. Spectacularly photographed by Dirk Bakker, the volume (published this month) also includes informative text on 37 houses of worship. In all, the project took 20 years and a Kickstarter campaign to complete. It was researched and written by Marla O. Collum, Barbara E. Krueger, and Dorothy Kostuch, a former nun and art-history instructor at the College for Creative Studies. Kostuch didn’t see the book’s completion; she died in 2005. One synagogue, Temple Beth El, is included, although neither of its two Woodward Avenue locations is used today as a Jewish house of worship. All but two of the edifices are in the city of Detroit; the others are in Hamtramck. They range from the oldest church building in Detroit (Saints Peter and Paul Roman Catholic, dedicated in 1848) to Hamtramck’s Immaculate Conception Ukrainian Catholic Church, built in 1942. Well-known churches are highlighted, but then so are some more obscure gems, such as Trinity Episcopal Church (now Spirit of Hope) and Nativity of Our Lord Catholic Church. 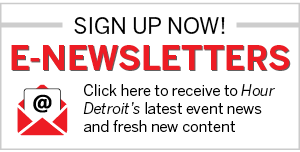 Naturally, there are omissions, but the authors, who will be donating book proceeds to “the Detroit church community,” have succeeded in including a variety of denominations, architectural styles, and periods. Following is a sampling of images from Detroit’s Historic Places of Worship. 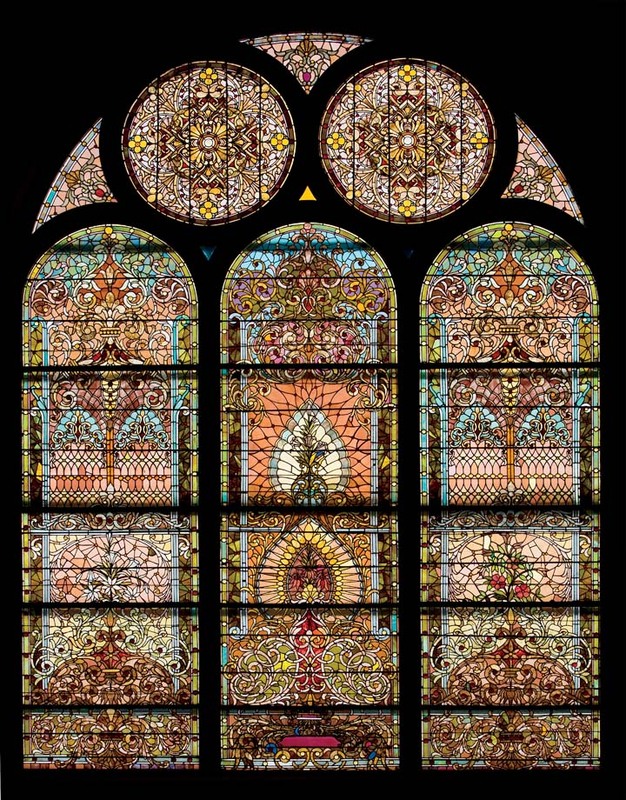 Stained-glass windows at Cass Avenue United Methodist Church (dedicated in 1892), designed by architects Malcomson and Higginbotham and fabricated by Tiffany Studios. 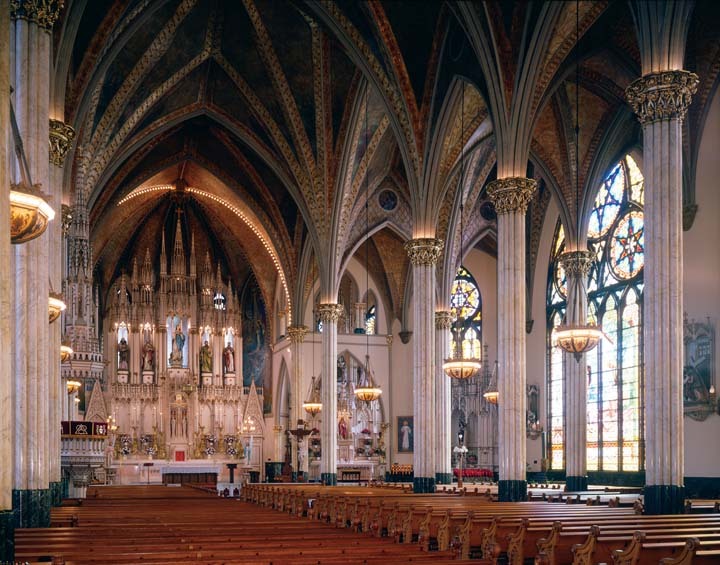 The elaborate interior of Sweetest Heart of Mary Roman Catholic Church, a Gothic Revival edifice dedicated in 1893. 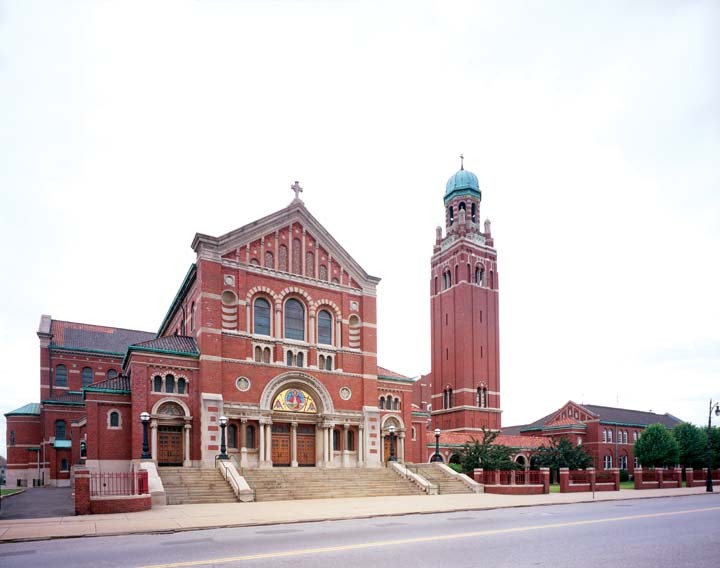 An exterior shot of Most Holy Redeemer Roman Catholic Church in Southwest Detroit, dedicated in 1923. The bell tower was added three years later to honor parishioners who died in World War I. 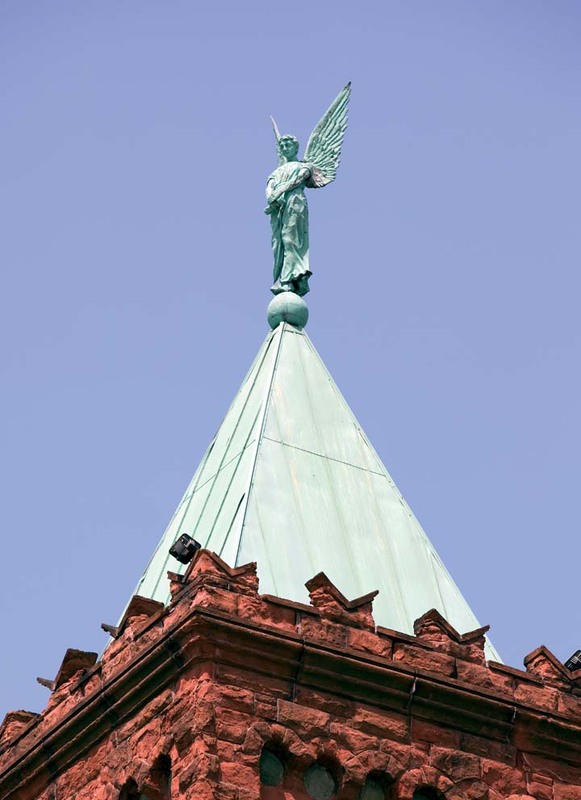 An 8-foot-tall bronze statue of the archangel Uriel keeps vigil atop the tower of the First Congregational Church, dedicated in 1891. 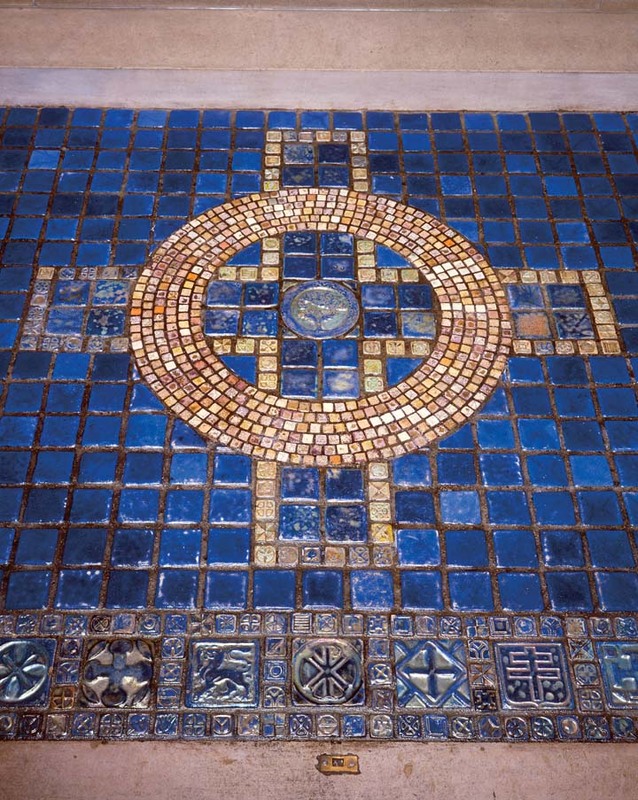 Pewabic Pottery distinguishes the floor of the Cathedral Church of Saint Paul, an Episcopal house of worship built in 1911. 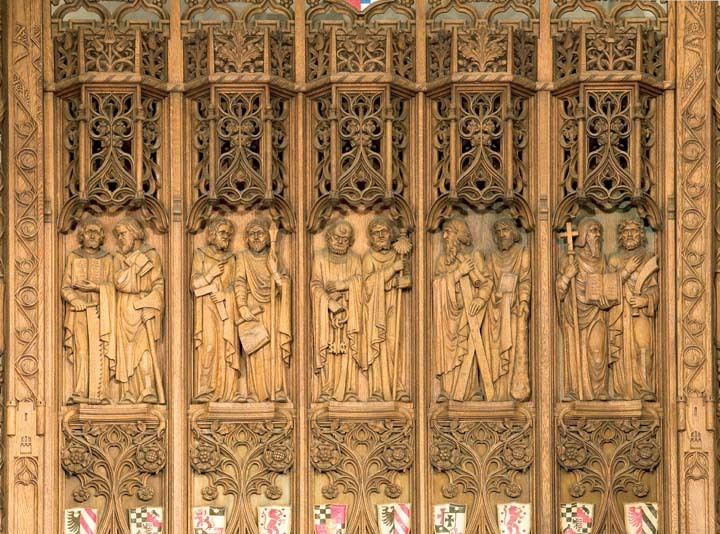 Woodcarvings by John Kirchmayer are among the exquisite details at Historic Trinity Lutheran Church, which opened in 1931.